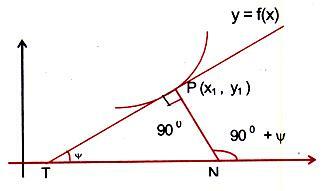 The tangent to the curve y = f(x) at the point (x, y) makes an angle y with the positive x-axis. Then dy/dx = tan Ψ. Thus the derivative dy/dx or f'(x) represents the slope of the tangent to the curve at the point (x, y). Having talked at length about (dy/dx)(x=a), which gives us the slope at any point of curve, the first thing which strikes an aspirant's mind is it's use to find the equation of tangent or normal of the curve at any point on the curve since dy/dx at x = a gives the slope of tangent at any point x = a of a curve y = f(x), so we can put the value of x = a in f(x) and find the corresponding value of y. Let us take another curve for explanation. 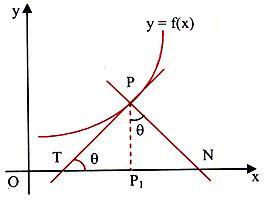 PT is the tangent to the curve y = f(x) at the point P(x1, y1). 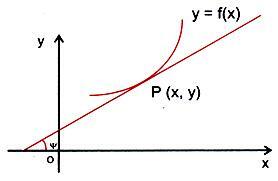 PN is the normal to the curve at P.
The slope of the tangent at P(x1, y1) is, [dy/dx](x1,y1). The slope of the normal at P(x1, y1) is, 1/[dy/dx](x1,y1). If (dy/dx)(x1,y1) = 0, then the equation of the normal would be x = x1. and   f'(t)[x - f(t)] + g'(t)[y - g(t)] = 0.
x-axis at 'T', and normal drawn at 'P' meets the x-axis at 'N'. 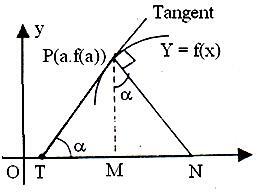 PT is called the length of the tangent and PN is called the length of the normal. If 'P1' be the projection of the point P on the x-axis then TP1 is called the sub-tangent (projection of line segment PT on the x-axis) and NP1 is called the sub normal (projection of line segment PN on the x-axis). Let ∠PTN = q => ∠ P1PN = q. We have tan q = dy/dx and PP1 = y.
PT = y√(1+ cot2 θ )=y√(1+(dx/dy)2 ). 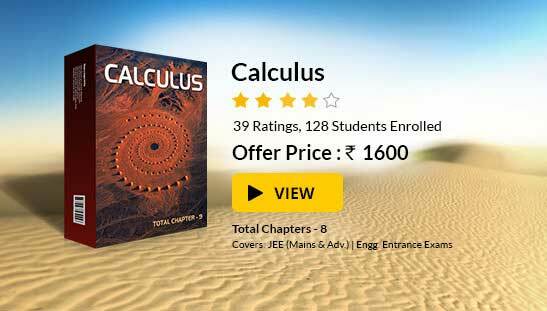 Also, PN = y sec q = y√(1+tan2 θ )=y√(1+(dy/dx)2 ). => Length of the normal, PN = |y| √(1+(dy/dx)2 ).